By simply replacing your home’s five most frequently used light bulbs with ENERGY STAR approved bulbs, you can save $75 each year! The incandescent light bulb gives off only 10% of its energy for light. The other 90% is in the form of heat. 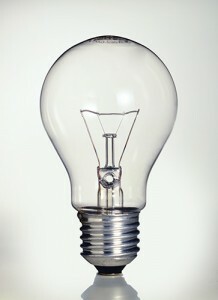 Let’s look briefly at the older, halogen incandescent, style of light bulb. Only 10% of the energy that goes into these bulbs is given off as light! The other 90% is given off as heat. So, for every dollar you spend on an incandescent bulb, you only get ten cents worth of light. Newer, LED (light emitting diode) and CFL (compact fluorescent lamps) bulbs both last significantly longer than their incandescent cousin. In fact LED’s last eight to 25 times longer than incandescent bulbs! The CFL & LED bulbs are more expensive to buy, but in the long run they pay for themselves very quickly by saving you money every month. You have many choices when it comes to your lighting. Let’s now look at compact fluorescent lamps: CFLs are simply smaller, curly versions of the long, tube-style fluorescent lights commonly found in offices, garages, or kitchens. CFLs that are ENERGY STAR-qualified use about one-fourth the energy and last 10 times longer than traditional (incandescent) bulbs, and use about one-third the energy. CFLs are available in a wide range of light colors and you can find dimmable options too. One thing to be aware of is that CFLs contain a small amount of mercury and should be recycled at the end of their lifespan, not thrown into the garbage to end up in landfills. Many retailers recycle CFLs for free. The newest type of light bulbs for your home are light emitting diodes (LED). These lights are relatively new to the residential market, but you’ve seen them before in traffic lights. 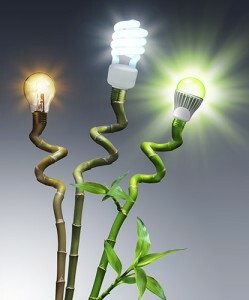 LED’s are one of today’s most energy-efficient technologies. They use 20% to 25% of the energy and last eight to 25 times longer than incandescent bulbs. Available in a wide variety of options, LED’s are more expensive upfront, but pay for themselves many times over during the course of their long life. The average consumer will spend about $4.80 to operate a 60-watt traditional incandescent, $3.50 for a halogen incandescent, $1.20 for a CFL, and $1.00 for a LED. Numbers are based upon two-hours-per-day of usage, and produce about the same amount of light. So … Help your bottom line and help save the Earth’s resources: By switching to energy-saving bulbs you not only will be saving money for yourself, but will reduce the U.S. energy demand and reduce carbon emissions. Visit your local hardware or home goods retailer next time you need a light bulb and look for comparable CFLs or LEDs. Then, simply replace your bulbs per manufacturers’ direction. To replace a 100 Watt (W) incandescent bulb, look for a bulb that gives you approximately 1,600 lumens. If you want something dimmer, go for less lumens; if you prefer brighter light, look for more lumens. Look for the Lighting Facts label on the package.